For a lot of people winter is something to be endured, a long season of cold, short days and stark skylines. The only escape seems to be a long haul flight to somewhere sunny and warm. In 1864 four English visitors to the Swiss Alps were due to return home for the winter. Their hotelier, Johannes Badrutt, said that they should come back at Christmas and stay until Easter, and if they didn’t find St Moritz as sunny in winter as it was in summer, he would pay their fares and hotel bills. Badrutt won the bet, and winter tourism was born. But what was there to do? Alpine skiing was yet to take off – Conan Doyle in nearby Davos was to have a large part to play in that story. 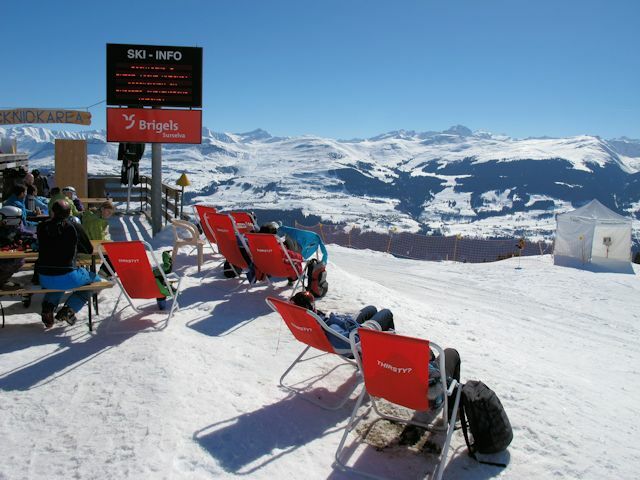 With a well-developed summer tourist industry, St Moritz, Davos and many other resorts quickly developed a significant infrastructure to enable winter visitors to while away their days, and nights, and the longest established resorts still have a huge variety of non-Downhill activities on offer. A recent article I read in the BA Leisure magazine, recommended a handful of resorts that suited both skiers and non-skiers. Megève, St Christoph, Cortina d’Ampezzo, Zermatt and Lake Tahoe make their shortlist, and it’s a good list. For the Americas, however, there are a number of resorts I would add to the list (see my ski USA page), and I think there are at least a couple of dozen other Alpine resorts as good for skiers as for non-skiers, particularly in Switzerland. But what to actually do? Innsbruck, Montreux and Basel have wonderful winter markets, although they close before Christmas. Many resorts and Alpine towns have wonderful outdoor and indoor ice rinks, and professional ice hockey teams play throughout the Alpine nations, with a major hockey festival in Davos known as the Spengler Cup. Bob sleigh also features at a few resorts, and at Celerina adrenalin junkies can actually take part in a four man bob team! More sedate winter sports available in the Alpine resorts include snowshoe trekking, cross-country skiing, curling and tobogganing. A town called Bergün is a mecca for tobogganing, with people visiting from all over Europe to take advantage of the runs there (and enjoy the breathtaking UNESCO listed railway you need to take to get to the start of the runs). My Swiss Winter Sports web site covers other winter sports you can participate in Switzerland in addition to skiing and snowboarding. There is a network of well maintained winter walks throughout the Alps, the reward mid-way along the walk often being a charming mountain restaurant. There are even Michelin listed resorts in the Alps! Zermatt is particularly renowned for its mountain restaurants. We love visiting resorts with spas, the best of which is probably Leukerbad, but there is plenty of choice. Villars opened a new spa this year. Switzerland and Austria have a highly reliable and extensive transport network which makes it very easy to choose a destination suited primarily to non-skiers, but which skiers can also use as a base for day trips to a variety of different destinations. Lucerne and Innsbruck are particularly good choices. Often the best time to go is March. The days are getting longer and the days warmer, but the snow base is usually still good. If you are prepared to leave it late to see how the snow conditions are developing, a lot of resorts provide particularly good deals before Christmas.